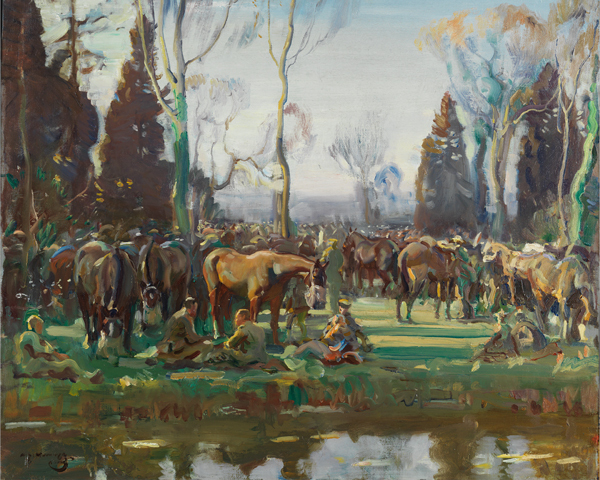 In 1918, the artist Alfred Munnings was tasked with recording the wartime contribution of the Canadian Cavalry Brigade and the Canadian Forestry Corps. His impressionist paintings highlight the military role of horses, capturing their beauty in the war-affected landscapes of France. They demonstrate both the importance of mounted troops and the vital work of horses behind the lines. In 1919, the Royal Academy of Arts hosted the 'Canadian War Memorials Exhibition'. This claimed to be ‘the most complete record of any country's share in the Great War, and the most significant manifestation of artistic activity during this period’. It was the first large London show of First World War art. Among the 355 works on display were 44 pictures by the artist Alfred James Munnings (1878-1959). Munnings was born into a family of millers in Mendham, Suffolk. Aged 14, he started working as a lithographic apprentice by day and attending Norwich School of Art by night. He went on to make a name for himself with his equine paintings, evocative pastoral scenes and skilled portraits. His work was first displayed at the Royal Academy in 1899. 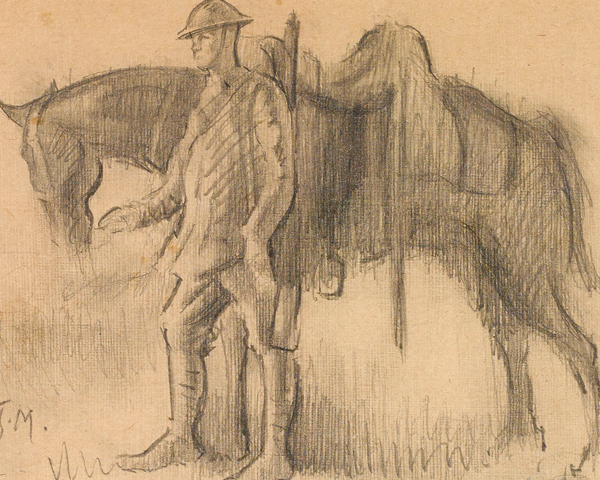 Following the outbreak of war in 1914, Munnings was eager to join the Army. He was turned down on medical grounds; a run-in with a thorn bush at the age of 20 had left him blind in his right eye. However, his equine experience led to him finding work examining Canadian horses destined for military service. 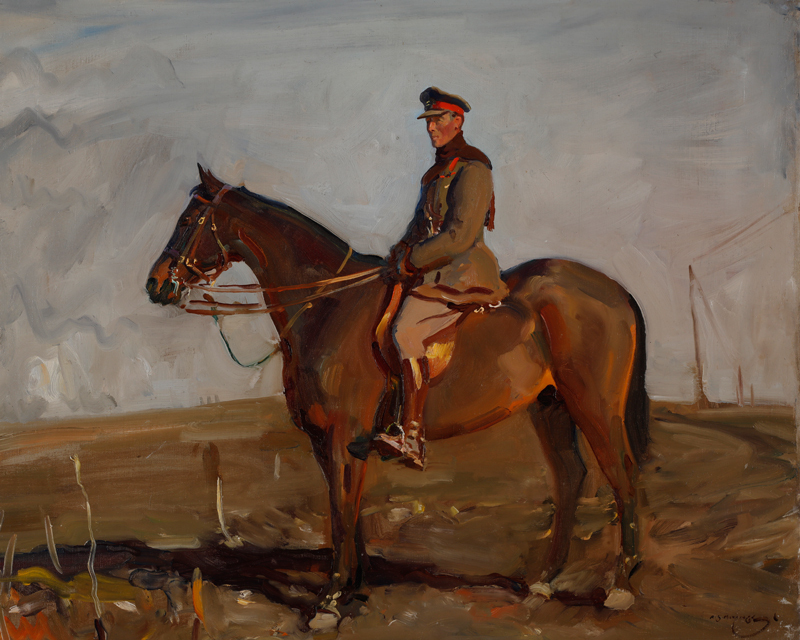 Munnings' involvement in the war took a more artistic turn in 1918, when he was commissioned by the Canadian War Memorial Fund to paint the Canadian Cavalry Brigade and Forestry Corps in France. Pioneered by Sir Max Aitken (later Lord Beaverbrook), the fund employed more than 100 artists to create a visual record of the Canadian Expeditionary Force’s contribution to the war. Together, these artists produced more than 800 works. But it was Munnings' pieces that stood out for their representation of the close relationship between cavalrymen and their horses. Although the use of cavalry was limited by advances in technology during the war, it remained a key military capability. Horses played a vital role supporting soldiers on the battlefield, not just in cavalry roles but also transporting heavy loads safely across difficult terrain. 'He turned up one morning in plain clothes, in this bleak area, where for months no human being had been seen in anything but French, English or German uniform. Of course it had never been the intention of the Canadian authorities that Munnings should join us in the front line, but this whimsical and gallant soul thought that this was just the best place in which to be. Impressionistic in style, Munnings’ canvases depict the splendour of both cavalry and lumber horses in the French landscape. His dynamic brushstrokes capture the play of light on the groomed horses' gleaming coats. ‘The Sheffield Daily Telegraph’, reviewing the 1919 exhibition, commented on the ‘beauty in desolation’ revealed by the Canadian war art. 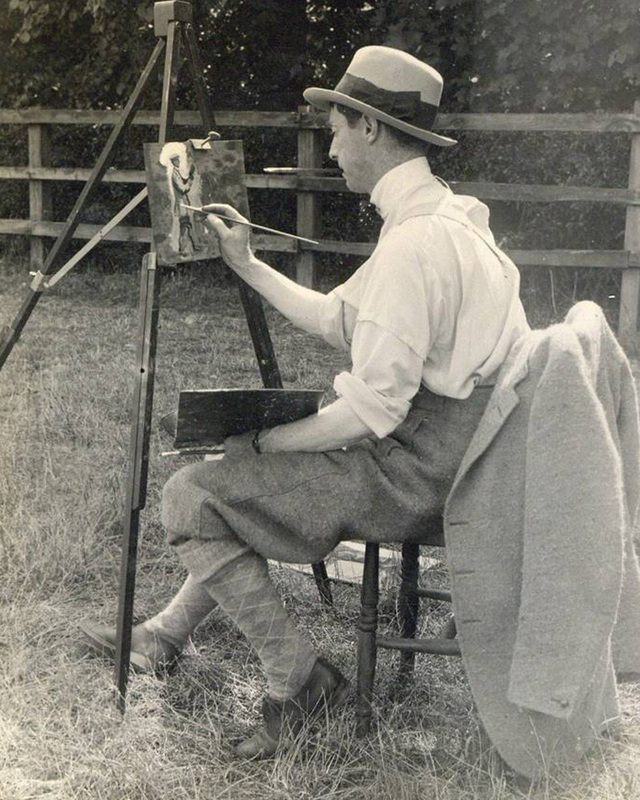 The paintings were well received and the show proved to be a turning point in Munnings’ career. Within weeks, he was elected one of the 30 Associate Members of the Royal Academy. His portrait of Major-General Jack Seely, in particular, led to a number of lucrative commissions from the horse-racing, riding and hunting fraternity. The paintings shown in the 1919 exhibition were returned to Canada, eventually ending up in the Canadian War Museum. But some of them never made it. One of these was Munnings' study of Brigadier-General Robert Paterson's horse, Peggy. Paterson had succeeded Seely as commanding officer of the Canadian Cavalry Brigade in May 1918. The painting of Peggy stayed in Paterson's family until 1984, when it was donated to the Winnipeg Art Gallery. In April 1921, an exhibition of 41 paintings by Munnings at London’s Alpine Club Gallery attracted the public in their thousands. This reinforced Munnings’ reputation and he was inundated with commissions for equestrian portraits. In 1944, he was knighted and also elected President of the Royal Academy. After his death in 1959, his remains were interred in the crypt of St Paul's Cathedral.